I'm diving into the new topic - Adaptive Case Management 12c and ADF integration. Today will be the first post in the category and there are more posts planned for the future. I strongly believe that ACM (Adaptive Case Management) makes a great extension for standard BPM. Mainly because it allows to define a loose process, without strict order steps. Process steps can be executed in different order, depending on the situation requirements, at given time. I will be explaining how to implement ADF Human Task for ACM activity and will share several tips, how to make it run in BPM Workspace application. You have some example of how call "startCase" operation via SoapUI or EM? Yes, I will try post it a new blog about it - tomorrow may be. That part still represents a gap for me. This is Soap UI payload problem, it must be formatted in a special way. I will post in future blog, how it should be formatted. I just want to thank you for your help! 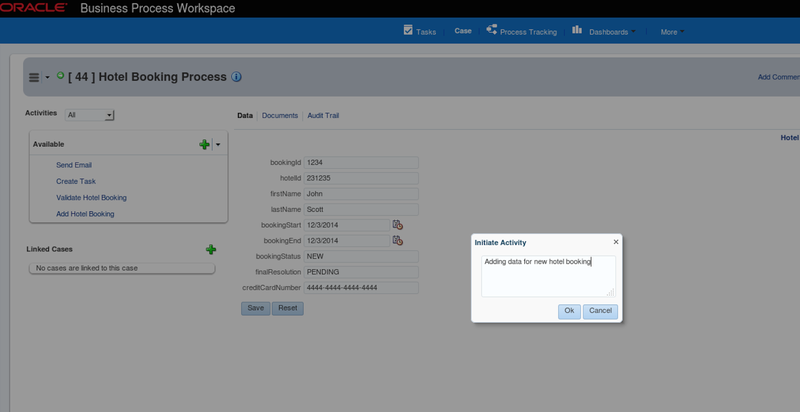 Important hint - auto generated human task form will not render in BPM workspace window. 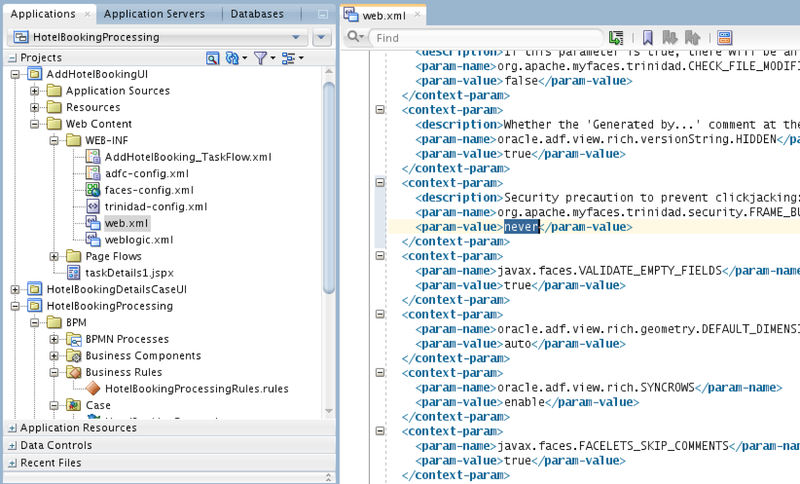 You need to change FRAME_BUSTING parameter generated in web.xml from differentOrigin to never. 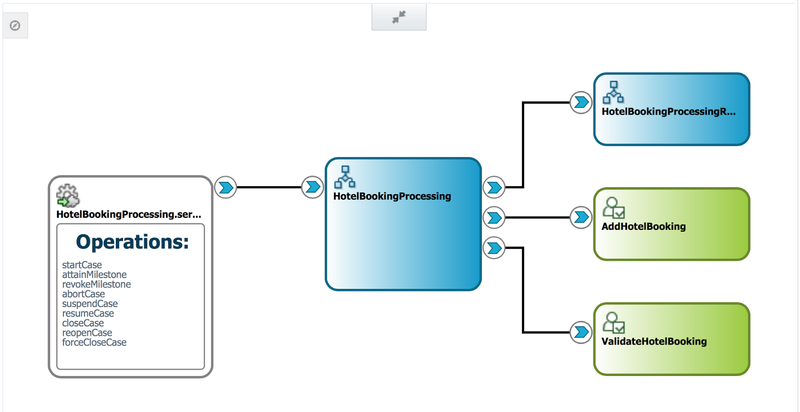 How you deploy the HotelBookingsDetailUI generated. I don't see the data, in the case workspace and don't see that the case UI is deployed. DO we need to create an ear file with this project ? 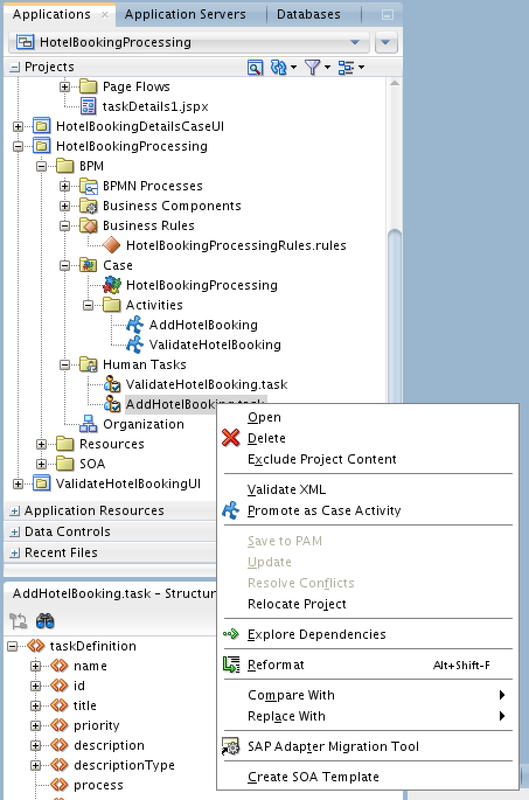 Thank you for your blog it was lot of help but we are stuck at one place when opened in workspace we are not able to see the form in data tab.Also while deploying I don't see HotelBookingsDetailUI being deployed. Can you please suggest whether we are missing some steps to perform.